Written with the art of a skilled fiction writer whose ear for Irish bluster is pitch-perfect, Whoredom in Kimmage tells the tale of contemporary Irish women through a series of brilliantly animated scences that take the reader from Dillon's tiny pub in rural Corofin to the heart of Dublin. This beguiling account of Irish life transcends that nation's small shores through the power of Mahoney's great storytelling gifts. Before the phenomena of Frank McCourt's Angela's Ashes, and Thomas Cahill's How the Irish Saved Civilization, Rosemary Mahoney traveled to Ireland in response to the growing feeling that changes were taking place, and that those changes directly involved women. Her ideas are animated in brilliantly crafted scenes, taking the reader from Dillon's tiny pub in Corofin to a lesbian pub in Dublin, from a Legion of Mary meeting to a classroom full of boisterous schoolgirls determined to drive their teacher, S'ta Keatin', over the edge. Here, too, are scenes with Ireland's first woman president, Mary Robinson, and the country's preeminent woman poet, Eavan Boland. But most memorable, and perhaps most prescient of the recent enchantment with literature about the Emerald Isle, are Mahoney's pitch-perfect ear for Irish bluster and warmth, her eye for detail, and people so real and unforgettable you'd think they were having a cup of tea with you. "Prose so pellucid and evocative that readers may want to stop and reread passages just to savor their rhythms and imagery." 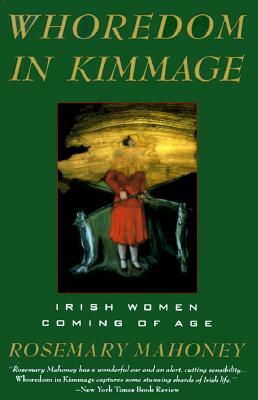 "Whoredom in Kimmage is a fascinating book: uncommonly well written, eminently readable, a thorough and perceptive investigation of its subject." "Rosemary Mahoney has a wonderful ear and an alert, cutting sensibility...Whoredom in Kimmage captures some stunning shards of Irish life." "Whoredom in Kimmage is a superb book, the close and patient observation of a world by a writer whose highly developed consciousness expresses itself with ease, mystery and grace." "Writing with a fondness that in true Hibernian fashion wavers not far from a frown, Mahoney vividly portrays a still-superstitious, class-ridden country belatedly stumbling into modernity." "This book has the fully furnished atmosphere of a work of fiction: Mahoney is brilliant at re-creating the cast of a face, the particular smell of a room. She is a realist and a miniaturist, and one of the pleasures of reading her comes from watching her show how each small detail, no bigger than the shape of a crooked, broken-toothed smile, fits into the bigger canvas of Irish life."